Must watch of the year. Before going to watch this movie, everyone might have speculations, preconceptions, and many thoughts as to what the real thing happened. This is a true story which took place and was the talk of the country for years. Some have anticipation of what might be the truth, some have pre-decided views of what happened and some who didn't know what happened. Coming back to the movie, it consists of all the ingredients to make it a blockbuster. A murder, many suspects and absurd local police work results into special police to take up the case. Enter Irrfan and the whole case takes a new angle. Newer thoughts are given to the case as to what might have happened with help of logic. The major thing about this movie is its logic as to what might have truly happened. Some dialogues are comical and really make you see the funny side of some situations. As the movie ended I wondered whether what might have happened because of the twist shown in the movie. But nonetheless this movie has been made with precision and sticks to its main topic. The only disappointing thing, perhaps, was Tabu not getting much of a role. For a powerful actor like Tabu she should have got a much better role than she got. Irrfan is spot on and is wonderful in every scene and so is Konkona. 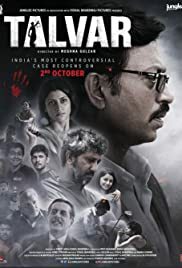 Verdict: A must watch even if you know or not know what happened in reality.